This is how I felt a couple of years back, before I recovered from IBS. My body felt out of control. The biggest challenge I had was trying to function as a normal balanced human being while trying to hang on. While my body and emotions swerved round corners, accelerated, came to a jolting halt. Then I suddenly started being slowly dragged up to the top to start again (aka IBS flare-ups). And over time, the more worried, frustrated and upset I got, the wilder the ride seemed to get. The best I could do was to come up with my IBS flare-up plan. This was really useful to make better choices and certainly reduced the pain and anxiety that went with them. The down side is that I still felt stuck. I didn’t want to be trying to manage my symptoms, and feel like I was being blown around like a leaf in the wind. I wanted to get off that ride and feel in control. 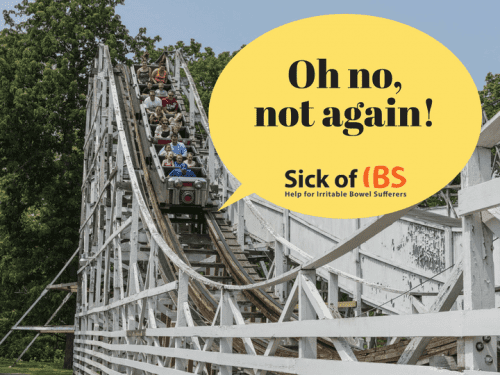 So how can you even start to deal with improving IBS while you’re on that ride? How do you even catch your breath? The answer is to do everything you can to slow down the ride. Slowing down the ride is an essential first step. But for many of us it is a big one. I didn’t know how to slow down the ride. I got to the extreme of not having a job anymore – which added other problems to the list (like financial worries and a profound identity crisis). This is what you can do instead: Steadily calm down your environment at home, and at work as much as possible, and let yourself become calmer too. Sounds great – but impossible? To make headway you will need to adopt a new habit: Putting yourself first for at least 20 minutes a day and switching off. Totally switching off. If this seems a stretch, start with 10 minutes and work your way up. If switching off is new to you, you may feel the urge to be “doing” something. Try some of these ideas and see what suits you best. You may battle with this at first. Don’t worry. It’s not something you can succeed or fail at. 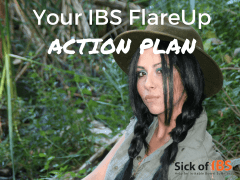 Just play with it – something most IBS sufferers have long forgotten how to do. Because everyday life has become serious and painful. So you have to work at playing, and reclaiming the colours in your life. Once you start feeling the benefits of unplugging, you will gradually find it easier to see how you can calm down other parts of your day. You will be more capable of taking a step back. Don’t even look for a result. Just try out a new daily habit and see where it leads. It may seem unproductive. But it’s a first step in actively doing something for your IBS, and learning to experiment. Once I could catch my breath, I was able to take other steps and begin to recover and heal . I no longer have IBS flare-ups to deal with. I got off that ride for good. What if you can too?